Melissa attended college in upstate New York, where she played Division I softball and pursued her degree in English. She graduated in 2002, and accepted a full scholarship to attend law school in Boston. 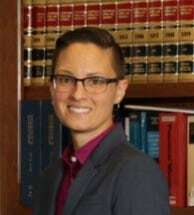 In 2005, after studying in Boston, doing a study abroad in Malta and spending a year studying at California Western School of Law San Diego, Melissa graduated from the New England School of Law. That summer, Melissa sat for, and passed, the bar exam. Melissa worked for several years in San Diego, and discovered, almost immediately, that her calling was criminal defense. After working at a small firm doing both civil and criminal defense, Melissa decided to look for a new home where she could practice exclusively criminal defense. In 2008, she was hired by Timothy B. Rien, then a solo practitioner, and she has been at home in Livermore ever since. Melissa is a tireless advocate for her clients. She works diligently to negotiate creative resolutions that meet the stated needs of her clients. Melissa is compassionate with clients, and zealous with prosecutors. Every client feels like a priority, and each is treated with respect and dignity. Melissa often encourages clients to call or email with questions, as often as needed in order to feel comfortable.